Spring breakers and winter travelers often think of Mexico’s touristy Cancún when seeking out a warm beach destination. Personally, I typically enjoy going to destinations that have a bit more cultural elements to enjoy, as well as beach fun. The 45-minute flight from Mexico City into Mazatlán is a perfect fit for someone like myself, who enjoys a more laid back experience in my warm-weather travels, especially if I plan to travel with my children. 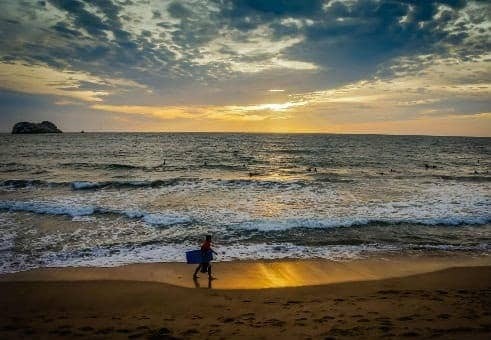 Located in the state of Sinaloa, along Mexico’s Pacific coast, Mazatlán is warmer and more humid than Cancún, but with all of the beaches, cooling off is not a problem. The area has a nice selection of resorts to accommodate every budget and lifestyle. El Cid Marina Beach Hotel is a nice choice for its proximity to the beach, its exclusive access to one of the best golf resorts in the area, large pools, and spacious, comfortable suites. The marina caters to yacht club members as well as resort guests, so visitors have access to shops, restaurants, and even a convenience store stocked with snacks and toiletries. Though the pace in Mazatlán is a bit more slow paced than it is in the bigger city, there’s still plenty to do and see. In addition to golfing (Mazatlán is rated as one of the best golfing destinations by aficionados), visitors can try ziplining, horseback riding and plenty of water activities. Of course, you also could just sit by the beach and tan, or take in the sunset along the beautiful malecón. For those who want to add some sightseeing to their adventures, there are a few islands worth a visit. Goat Island, Deer Island, and Bird Island all are eco-preserves accessible by boat or Jet Ski. Stone Island is great for hikers and is accessible by both land and sea. Mazatlán’s Historic District is a fascinating display of the town’s 500-year-old cultural heritage. Many of the 19th-century buildings have gone through extensive renovations over the years, helping to revitalize the area and make it a central hub for socializing. The huge Día de Los Muertos festivities take place there, and restaurants such as the popular Pedro and Lola offer outdoor seating so you never have to miss a thing. When in the old town, make sure to stop in at the Angela Peralta Theater, founded in 1874 and renamed after the country’s most renowned soprano. Throughout the centuries it has remained one of Mexico’s most distinguished cultural centers. One of the things I most admired about the people of Mazatlán is their passionate appreciation for the arts. On any given day, they will be hosting world famous artists to perform at this theatre to a sold out audience. I think this is important to note, as most people view Mexico and other Latin-American destinations as having nothing more to offer than beach and sun. The reality is that places like Mazatlán have dozens of venues at which visitors can experience local culture. I highly recommend taking an excursion to the rural town of El Quelite. This spot is celebrated for its beautiful red-roof houses surrounded by bugambilias, or bougainvillea, vines. When you go, make sure to dine at El Mesón de los Laureanos, a popular eatery that serves dishes family-style, and often hosts fun entertainment. What I enjoyed most about this restaurant is the way the place celebrates the cultural tradition of family and food, even if your family at that moment are some friends you met along the way. Viewfinder Tip: Mazatlán is a short drive to other favorite attractions, such as the Mayan Riviera and Tulum. Both are reachable on a day trip. Several other things to note about Mazatlán: The region is the world’s largest shrimp distributor, so expect to taste lots of shrimp prepared in many different ways. Also, the local beer is the Pacifico (though of course when in Mexico one should also take the time to enjoy some mezcal or tequila). Overall, the people of Mazatlán are warm and inviting, and their home region offers a very different Mexican cultural experience. The food is great, the beaches are beautiful, and the opportunities for adventure are endless. What are your favorite beach destinations in Mexico?